Size of this preview: 560 × 599 pixels. Other resolutions: 224 × 240 pixels | 2,000 × 2,141 pixels. 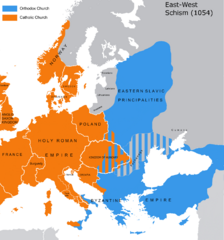 Description: The map of the eastern/western allegiances in 1054 with the former country borders.